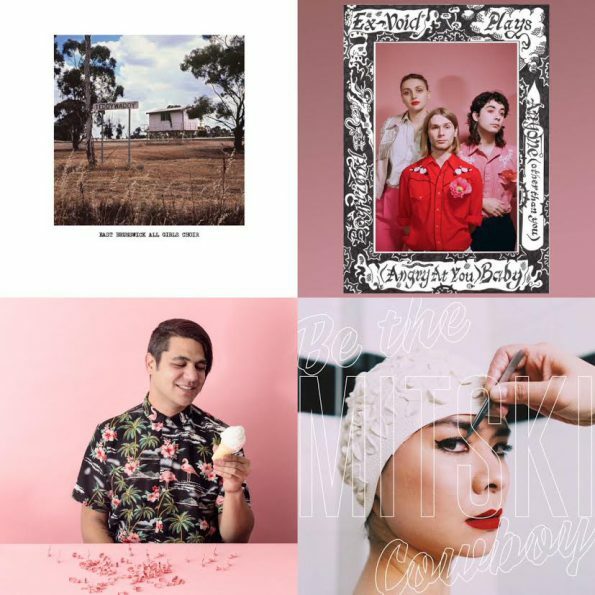 Welcome returns, new discoveries, and surprises…lots of fun in this edition of Tracks of the Week, with one caveat: the louder, the better. Four years away have not dimmed the light of Melbourne, Australia’s East Brunswick All Girls Choir. They’re back with the ferocious “Essendon 1986,” lead cut from the forthcoming Teddywaddy out June 29th on Milk! Records. Despite being a January single from earlier this year, “Contrapasso” from Oakland’s COMPLTR, conjures up serious Wire vibes with a relentless chorus and refuses to leave our rotation. Another new favorite turning our heads is New Zealand’s Wax Chattels whose debut LP is out now on Flying Nun and Captured Tracks here in the United States. “In My Mouth” will rule your world. Ex-Vöid is the next step for Alanna McCardle and Owen Williams, (Joanna Gruesome), and “Boyfriend” gives you a taste of what to expect from their new 3 song cassette single, out on Don Giovanni. Finally, in the “surprise” department, Mitski shows off her arranging skills, weaving disparate chunks into a compelling whole in “Geyser,” the first cut from Be The Cowboy, out August 17th on Dead Oceans.